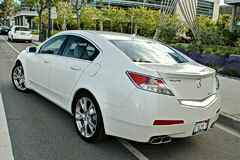 The 2010 Acura TL comes in two main variants, the base TL with front wheel drive and 280 hp, and the SH-AWD with all-wheel drive and 305 hp. We tested the fully loaded TL SH-AWD with the Technology Package option and high performance tires. 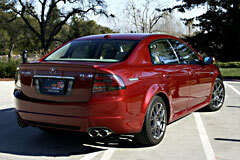 Additionally, new for 2010, our TL came with a 6-speed manual. Sticker price was $43,385 plus $810 for destination and handling. Typically, the “Styling” section is left toward the end of the review. With the TL, we have to make an exception. The previous generation TL (2004-2008) was one of the most handsome looking cars in recent memory. In particular, I loved the “blood groove” crease that ran the entire length of the car. And the gorgeous front end and wheels combine to give it a “tailored suit” look. This revised model, now in its second year, doesn’t retain the same striking looks. To be fair, there are some nice styling touches. The front wheel arch gracefully and muscularly interrupts the side view. And the flowing crease from the front to the rear doesn’t look bad. The headlights are sort of menacing and look great next to the amber parking lights. Once behind the wheel, the Acura sheds its controversial styling in an instant. This car is awesome to drive. It magically combines luxury and sportiness in with seamless competence. Around town, the ride is smooth and luxurious; the car feels like it has massive suspension travel and high ground clearance. There is some thunking over speed bumps but it doesn’t feel like a “sports car” that you have to creep up driveways. Yet, once you put the throttle down and enter the twisties, the car transforms. I’m not a track driver and my daring/idiotic performance driving tendencies of the past have been muted with age and experience. My limited driving skills notwithstanding, this car is incredible. The SH-AWD really works; the concept is that it transfers power to the outer wheels with the most traction and shifts from front to rear as needed. It’s like all wheel drive limited slip. In practice, there is a wide, off camber freeway on-ramp that I hurl my poor 4,000 pound Audi A6 4.2 into every morning. Mass-induced body lean always creates an awkward and ungraceful wallow around the corner. 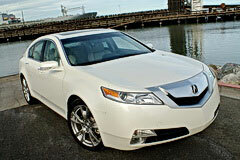 With the Acura it was a completely different experience. Body lean is minimized. And, as if by magic, the car shifts from front wheel drive bias — you can feel them scratching for traction as the turn is initiated — to rear wheel drive effectively turning the rear back into line. Simply amazing to hear and feel tire squeal at the front and then, in an instant, at the rear. This SH-AWD system, though obviously electronically controlled, is amazing in how effective and dramatic it is. In comparison, the BMW 335i feels more organic while the Audi A4 with its adaptive suspension dampening feels more muted. 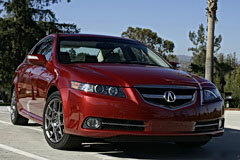 The Acura feels much more overt than either, which tempts you to really push the limits. Bottom line: it’s a blast to drive! The interior was a mixed bag. The dashboard layout is excellent and the materials felt rich. Controls fall readily at hand. However, the mesh metallic interior trim that is sprinkled throughout reminds me of an electric razor; it’s a bit boy-racer for an otherwise upscale feeling car. The high door sills, low door handles, and compromised view out the back (hindered by the third brake light) conspire to create a feeling that you are sitting very low in the car. The owner’s manual is a full 598 pages long (!) and much of it is dedicated to navigating through the menus for the infotainment system. The menus are consistent but still overly complicated. Once past the techno-hysteria, we discovered syncing with the iPod was instantaneous and the best implementation I’ve seen so far. The Tech Package also included the superb ELS DVD-Audio system which sounded terrific. The front seats were supportive and extremely comfortable and, at 6 feet tall, I had plenty of room. Moving to the back with the driver’s seat in my comfortable position, there was still reasonable knee, leg, and head room in the rear. Rear seats were much more comfortable than the previously tested BMW 3-series or Audi A4. The trunk is a little small for its class, offering 13 cubic feet of storage. Sometimes more trunk space is desired. Unfortunately, the rear seats don’t flop down to pass through larger items. The build quality of the Acura is impressive. It feels heavier than Hondas of the past and much more substantial than recent Toyotas I’ve driven. It is actually very reminiscent of the exceptional Cadillac CTS that we recently drove. 2011 MyLincoln Touch Review – Help or hindrance while driving the Lincoln MKX? I have a 2002, TL and really liked this model before the 2009 version. Great review. May have to go used if I want another one. Hideous ugly awful what was Honda this when they signed off on this mess.